This EKG comes courtesy of Dr. Mohammad Hassan and Dr. Husain. A 30 Year old male with a history of panic attacks presented to the ED complaining of palpitations and SOB. He states it began after drinking iced tea and coffee. He did not syncopize. He denied chest pain, nausea, vomiting. He appears lethargic with a waxing and waning mental status. Vital signs: Pulse – 230, Respirations – 20, BP – 90/50. The EKG shows a wide complex tachycardia. The patient is unstable. The appropriate treatment is electrical synchronized cardioversion. The EKG shows a wide complex tachycardia. That should be treated as v-tach until proven otherwise. In this case, the rhythm is irregular. V-tach should be regular. When you see a very fast irregular wide complex tachycardia, it raises the concern for a-fib with underlying WPW. The patient was unstable so he was treated with electrical cardioversion. His post-cardioversion EKG is below. It shows a sinus rhythm with a short PR interval and a delta wave consistent with WPW. It was later discovered that the patient had a history of WPW and had a previous ablation. WPW puts patients at risk for tachyarrhythmias. 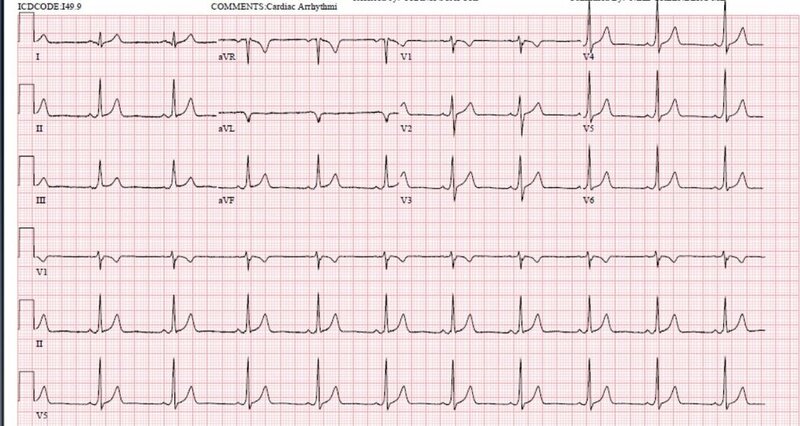 SVT is the most common arrhythmia in WPW. A-fib is the most dangerous arrhythmia in WPW. It can lead to unopposed conduction down the accessory pathway which can lead to V fib. Patients with a-fib in WPW who are unstable should be treated with electrical cardioversion. Patients who are stable should be treated with procainamide. Our patient was treated with cardioversion and he converted to sinus rhythm. He became more stable. He was admitted to telemetry and had an ablation performed.